After the initial trailer released for Batman v Superman, I felt excited. Very excited. But that excitement cannot compare to the sheer exuberance I experienced while watching the latest trailer the other day. Why so very enthusiastic? It’s not merely the sight of Wonder Woman in all her Amazonian glory. It’s not just watching Batman moving from building to building like Batman should. It’s not only Batman and Superman squaring off, jaw to jaw, after Superman rips off the doors to the Batmobile. Yes, all of that was … is … mesmerizing. No, the best part proved to be the idea that actions have consequences and that they matter. What bothered me most about Man of Steel was the fact that Superman seemed oblivious to the loss of human life occurring during his fight with Zod. Buildings literally fell during this climatic battle, and Superman didn’t seem to care. Batman v Superman addresses that concern. Watching Superman stand before politicians touched upon the problem, but seeing Bruce Wayne running into the dust as others fled, watching Wayne glare into the skyline as Superman and Zod recklessly fought one another, that provided the emotional resonance I so desire. That look on Wayne’s face laid the groundwork for why he and Superman have conflict. That expression exceeded even my disdain for Supermans’ actions. I understood Batman’s anger – I even related to it. We, of course, know that Batman and Superman will eventually resolve their conflict, but they’ve found the one thing that validates the entire premise of the film, and they’ve done a masterful job setting up the confrontation through the latest trailer. Take a look below, and please do share your thoughts. 1. The Tone – I like the tone. 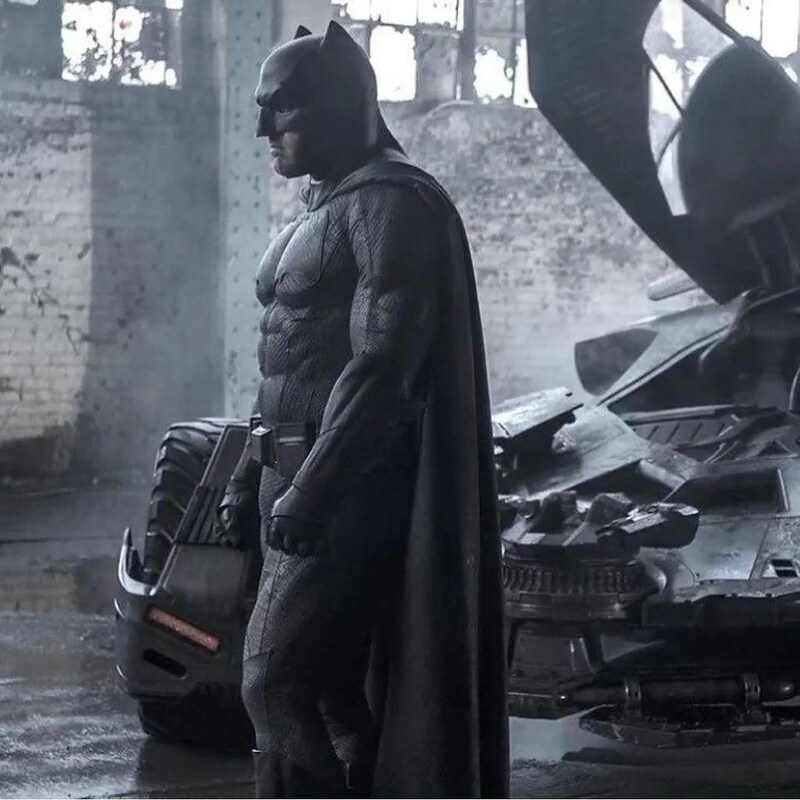 Batman appears menacing, society seems both enamored with and distrustful of Superman, and everything looks cinematic. The music is brooding yet epic. I’m sure the movie will be as well. If nothing else, visually speaking, it’s beautiful. 2. False God – As stated above, I very much think our present day society would have a field day with Superman if he truly existed. We love our larger-than-life figures, and you can’t get bigger than Superman. I have no doubt our celebrity culture would deify him, and this looks to be the case according to the statue. However, as is so often the case, we always tear down our celebrity heroes, it’s only a matter of time. Again, the graffiti scrolled across the statue would suggest as such. Superman appears to be no exception to our base behavior. 4. The Voice – I like the armored Batman voice. It’s gravely, yet metallic. It effectively hides Bruce Wayne’s real voice, as one would expect in the real world. Is it the same voice even when Batman isn’t armored up? Only time will tell. 5. Dark Knight Returns Returns – The armored Batman calling out Superman on the street … straight out of The Dark Knight Returns by Frank Miller. This is a good thing. I can’t imagine the movie will end as did the book, but the mere fact they are paying homage to such an iconic moment … it’s thrilling. Aquaman Confirmed For Batman v. Superman, and You Better Not Laugh! So this will be the most geeky post you read today, if not the entire month. Jason Momoa (of Game of Thrones, Conan the Barbarian, and Stargate: Atlantis) has been confirmed at Aquaman in the new Batman v. Superman movie, which is sort of the sequel to Man of Steel. I can’t claim to be a Jason Momoa fan. I’m really not that familiar with his work. However, I am an Aquaman fan. Yeah, I said it. Then, slowly but surely, they brought back the orange scale armor and green pants, lost the beard, shortened the hair, and even gave him his hand back. But they kept the warrior attitude. All too often people think of Aquman only as the guy who can talk to fish. But let’s run down his powers and characteristics. He’s the son of both a human and the queen of Atlantis. He was raised by the father, but discovered his heritage as a young man. After his father died, he went in search of Atlantis, and was named rightful king. He is the king of the Seven Seas, which, as you know, accounts for 75% of the planet. He can telepathically push aquatic life to do his bidding – this includes sharks, whales, etc. His body is super dense which enables him to withstand the ocean depths, this gives him incredible strength and also makes his skin impervious to most human weapons. Furthermore, because of the dense muscles that allow him to swim hundreds of miles per hour, he can also leap incredible amounts of distance while on land. Plus, during his current incarnation, he has an unbreakable trident which is a relic form ancient Atlantis. Aquaman is more than capable of living outside of water for long spans of time. Aquaman wants nothing more than to bring peace to both the surface world and his kingdom. He is an environmentalist, a warrior king, and a hero when serving with the Justice League. Let’s not forget Aquman’s queen, Mera. Mera is a warrior as well, also an outsider of Atlantis, and a woman for whom you do not want to trifle. She can control water, shape it as she wishes, move it as she wants. She is a formidable character in her own right, a character more than capable of carrying her own series. When coupled with Aquaman, they are irresistible. I sincerely hope they cast Mera in Batman v. Superman as well, for she would amaze movie goers. So, are you convinced? Do you now see Aquaman as more than the guy who talks to fish? A few years ago, DC Comics (sort of) rebooted their universe. Geoff Johns, who is known for revitalizing old favorites, decided to make Aquman his pet project. I’ve read the first four volumes, and I loved them. Johns is building a mythology around both Atlantis and Aquaman like never before. Check out the first volume – it’s called Aquaman: The Trench. If done well, Aquaman could be like Lord of the Rings under water. There is an epic story just waiting to be told. If someone dedicated themselves to building a world for Aquaman like James Cameron did for Avatar, the potential is limitless.